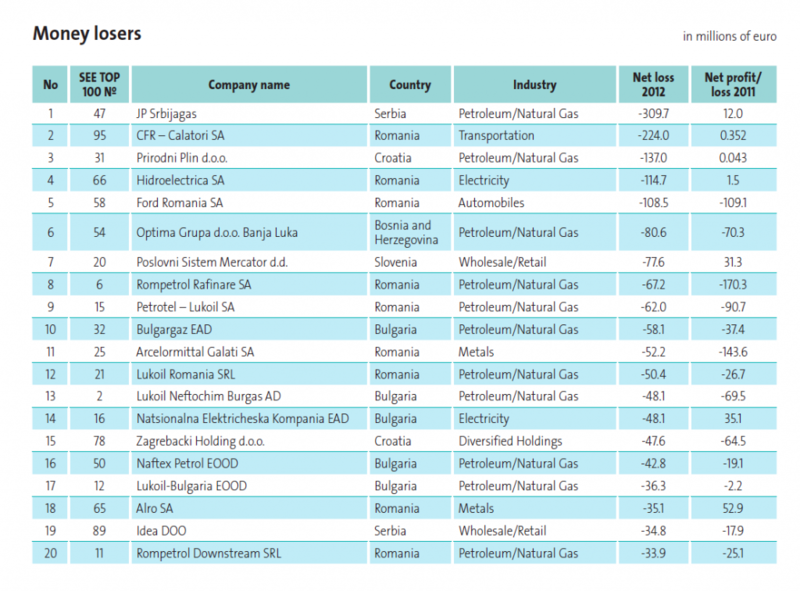 Energy companies booked the majority of Southeast Europe’s heftiest corporate losses in 2012 as 13 oil, gas and electricity firms made the TOP 20 money losers ranking of predominantly heavy-industry entries. Companies that turned 2011 bottom lines into SEE’s biggest losses took the top four spots in the 2012 standings. Number one in the losers’ ranking was Serbian gas provider JP Srbijagas which posted a net loss of 309.7 million euro last year versus a net profit of 12 million euro a year earlier. Romanian railway passenger transport company CFR – Calatori SA ranked second with a 224-million-euro loss, compared with a net profit of 352,000 euro, followed by Croatian natural gas supplier Prirodni Plin d.o.o., which reported a net loss of 137 million euro after a net profit of 43,000 euro in 2011. Romanian hydropower generation company Hidroelectrica SA ranked fourth, as it booked a net loss of 114.7 million euro in 2012 following a 1.5-millioneuro profit in 2011. Serbia may have placed the biggest loser on the 2012 table but had just two companies in it – JP Srbijagas and Idea DOO of the wholesale/ retail industry at 19th position – compared with five firms in the 2011 standings. Romania, which had the second and fourth largest money losers, counted nine companies in the 2012 standings, down from 11 in 2011. Most of Romania’s other loss-making enterprises in 2012 operated in the oil and gas industry, the other being representatives of the metals and automobile sectors. Refiner Rompetrol Rafinare SA and oil company Petrotel – Lukoil SA, ranked 8th and 9th respectively, saw their losses shrink in 2012 from a year earlier, while Lukoil Romania SRL, at 12th spot, and Rompetrol Downstream SRL, placed 20th, extended their losses over the year. Ford Romania SA narrowed its loss to 108.5 million euro from 109.1 million euro but nevertheless ranked fifth in the 2012 losers standings. Romania’s metals industry representative Arcelormittal Galati SA more than halved losses but still made the 2012 list at 11th place; yet down from the fifth biggest loser spot in 2011. Another Romanian metal industry entry in 2012 was Alro SA which turned a 52.9-million-euro net profit in 2011 into a net loss of 35.1 million euro in 2012, ranking 18th. Romania’s lower number of entrants came at the expense of Bulgarian companies whose number rose to five in 2012 from three in 2011, with all five operating in the energy sector – four in the oil and gas industry and one in the electricity sector. Apart from third-placed Prirodni Plin, Croatia had one other company in the 20 biggest losers ranking, diversified holding group Zagrebacki Holding at 15th position, one of the few non-heavy-industry entries alongside Slovenia’s only representative, Poslovni Sistem Mercator of the wholesale/retail industry, ranked seventh with a net loss of 77.6 million euro versus a 31.3-million-euro net profit in 2011. Oil company Optima Grupa d.o.o. Banja Luka was Bosnia and Herzegovina’s only entry in the 2012 money losers standings at 6th spot after none of the country’s companies had made the 2011 losers list.